The BSF Troops deployed in Meghalaya seized Bangladeshi Taka, Wooden Logs and Liquors from three different locations all over the state. The BSF troops deployed at Nongjuri, East Khasi Hills district seized Bangladeshi Taka 3.4 lacs while one unknown BD miscreant tried to infiltrate into Indian territory from Bangladesh last night. No sooner did valiant soldiers of BSF reached there, Bangladeshi miscreant fled away taking the advantage of dense forest and rainy dark night. The BSF party cordon off the area and recovered Bangladeshi Taka which was wrapped in a polythene bag. It must be noted that the few months back BSF troops had recovered Taka 10.83 Lacs and apprehended three racketeers also in the area of Balat, East Khasi Hills district of Meghalaya. The recovered amount this times also seems to be illegal payment for deal between smugglers. In an another instance troops deployed at Gumaghat, South West Khasi Hills district of Meghalaya, seized huge quantity of wooden logs (87.59 cft) and several bamboos worth Rs.93,000/- last night while being smuggled from India to Bangladesh through blowing water of river Jadukata. BSF has been keeping extra vigil with the help of modern surveillance equipments and succeeded to make several such achievements. While in the third instance BSF Troops deployed at Rongra, South Garo Hills district of Meghalaya, seized 185 bottles of liquor while being smuggled from India to Bangladesh. 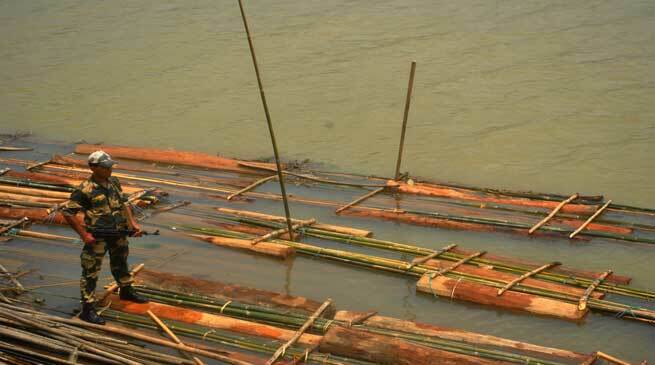 Smugglers were attempting to smuggle this huge quantity of liquor in 16 cases on a bamboo raft through a nullah. On being challenged by BSF troops they managed to escape towards Bangladesh territory. The Indian made liquor is sold at a very high price in Bangladesh, thus making it very lucrative item for smuggling into Bangladesh by smugglers of both the sides.